Colby Genoway had a goal and an assist and Al Montoya made 33 saves to lead Hartford to a 3-1 win over Manchester in a Wednesday morning start at the Hartford Civic Center. Thomas Pock and Ivan Baranka recorded two assists each for the Wolf Pack, who kept pace with first-place Portland in the Atlantic Division. Dwight Helminen and Nigel Dawes also scored for Hartford. Joe Rullier, acquired by the Monarchs from Hartford last week, picked up the Manchester goal. Montoya stopped all 29 shots he faced over the final two periods to improve his record to 7-0-1 over his last eight decisions and 20-5-1 on the season. Paul Brown scored four minutes into the third period, providing the margin of victory in Milwaukee’s 4-3 decision at Hamilton on Wednesday night. The win clinches a berth for the Admirals in the 2006 Calder Cup Playoffs, and ties them with Houston for first place in the West Division. Simon Gamache recorded a goal and an assist and Greg Classen and Greg Zanon registered two assists each for Milwaukee. The Admirals, Calder Cup champions in 2004, are heading to the AHL postseason for the fourth year in a row. Jani Hurme stopped five shots in overtime and denied the last seven attempts in the shootout as Portland escaped with a 2-1 win over Wilkes-Barre/Scranton on Wednesday night. The Pirates maintained their six-point lead over Hartford atop the Atlantic. Garett Bembridge scored in the second period for Portland, and Hurme made the lead stand up until Ryan Stone answered on a Penguins power play with 2:45 left in regulation. 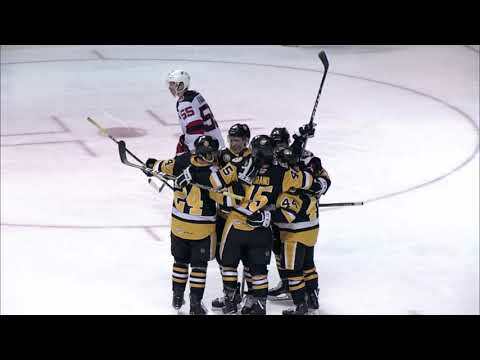 Wilkes-Barre was credited with a 5-0 edge in shots in the overtime period, but could not bury the winner. The Penguins converted on each of their first two shootout tries, but were held scoreless the rest of the way. Zenon Konopka tallied the winner for Portland in the ninth round. Bobby Robins scored his first two professional goals to help Binghamton to a 5-3 win over Albany. The Senators, 4-0-0-1 in their last five games, are now just six points back of fourth-place Bridgeport in the East Division. Robins, who joined Binghamton out of UMass-Lowell last week, scored both the first and last goals of the night for the Sens. His goal 7:16 into the second period began Binghamton’s comeback from a 2-0 deficit. Filip Novak, Danny Bois and Charlie Stephens also scored for the B-Sens. Brian Maloney and Mark Popovic recorded a goal and an assist apiece as Chicago defeated San Antonio, 5-2. The Wolves now trail fourth-place Omaha by nine points in the West Division. Bob Nardella snapped a 2-2 tie with two seconds left in the first period. Kevin Doell and Justin Morrison also scored for Chicago. Michael Garnett made 25 saves for the win.